Stephen Fazio came to me as a pre-college student and, as he lived in nearby Wellington, took lessons with me in my Oberlin office. Eventually, he enrolled in my studio at The University of Akron but after a few years of study there, decided to transfer to Oberlin and finish his bachelors degree at the Conservatory. As one of the most talented students to ever pass through my studios, he got a handsome scholarship and now, after a long and fruitful collaboration, is wrapping up his undergraduate studies. His program was relatively modest, belying the numerous large works he'd studied in the course of our work together. A two-time first-prize winner in the Stroud Guitar Competition, and a successful veteran of other guitar competitions, Fazio had long proven his mettle. (See his Junior recital here). 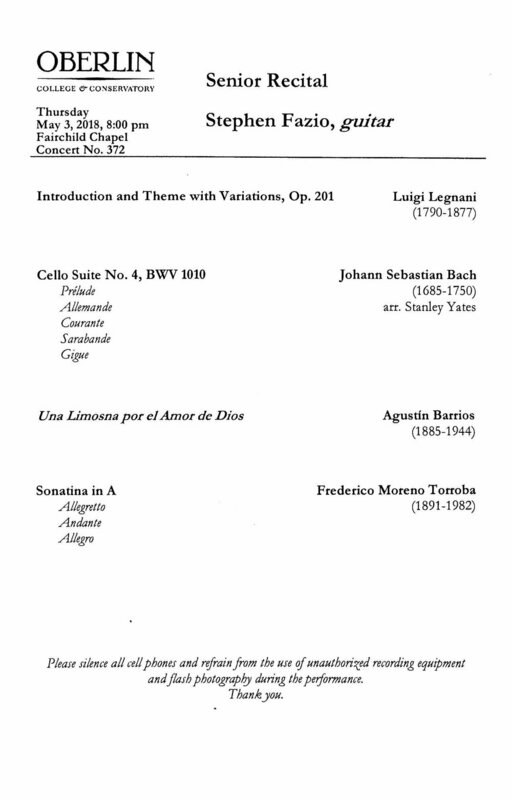 This program featured a seldom-played but charming and technically demanding variations set by Legnani, the towering fourth Cello Suite of Bach, and works by Barrios and Moreno-Torroba (the full program is reproduced at the end of the post). Stephen played with his usual elan, demonstrating total command of the material and an on-stage insousiance that is the envy of many. He had a particularly winning way with the Legnani; his Bach, though a famously demanding work, was both brilliant and apparently effortless. I hope that many more will get to hear this remarkable young artist as time passes! I've very much enjoyed my time with Stephen and wish him well in his future studies and adventures. Bravo!! Nov 10 Stephen Fazio's Junior Recital and Mini-Tour.